As we head into the holiday season, More Than Paper is on the hunt for perfect gifts for everyone on our list. We know of a few wine and cheese connoisseurs, so we've scoured the web and our store for perfect gifts they're sure to love. Here are our top gifts for wine and cheese lovers! Up first, More Than Paper carries this affordable wine tote that can be personalized with up to 15 characters. Add a bottle of wine and glasses for wine picnic! We also love this basket of wine and cheese gifts from igourmet. They have an incredible selection of upscale wine and cheese gifts, as well as many other hard to find gourmet items. 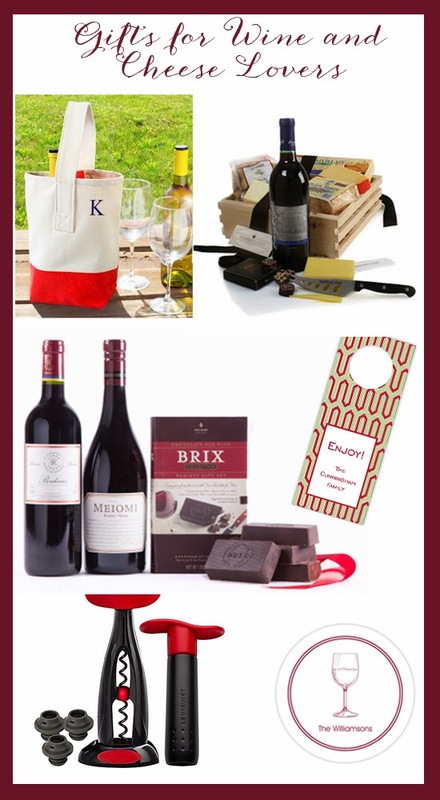 We love this red wine and chocolate basket combo! For the wine lover that also loves to give wine as a gift, give them some personalized wine gift tags by Boatman Geller available at More Than Paper. Le Cruset makes a very easy wine opener and vacuum to keep your wine fresh at an affordable price. Find this great gift here! And lastly, these great personalized wine coasters are the perfect touch to a home bar. 100 coasters for just $45, they are available at More Than Paper. So what do you think? Do you have any great ideas to share with us? We'd love to hear them!